Note from shop owner Hello, thank you for visiting my shop! Unfortunately I am currently overseas for my day job. Feel free to convo me for a list of places where the dolls may be available in Charlotte, NC and Brooklyn, NY. Hello, thank you for visiting my shop! Unfortunately I am currently overseas for my day job. Feel free to convo me for a list of places where the dolls may be available in Charlotte, NC and Brooklyn, NY. Thank you so much - we adore our babies! Sew Your Own Snuggly Doll Kit, Sew Your Own 7" Doll, Create Your Own Felt Doll, Learn to Sew Choice of Prints, Ready to Ship! I love this sewn your own baby doll! Cute! 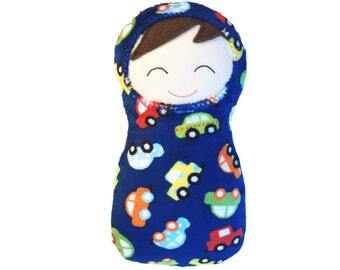 NEW: Cars of all shapes and colors bedeck the royal blue background of this soft minky! Perfect for little ones who love everything cars. The dolls were recently featured in CV Luxury magazine. Wholesalers, boutiques, and bulk purchasers, please convo me for discounts. Two important things happened on Christmas Day a few months after I turned four years old: My mom taught me how to sew and I sewed a doll -- the very first doll I can remember. After sitting under and playing with fabric scraps from my mom's sewing table during my toddler years, my mom gave me a simple toy sewing machine. She taught me to sew a straight stitch and we proceeded to sew the preprinted fabric doll that came with the sewing machine. I remember stuffing the doll and watching it take form. I was amazed I had actually made something I could cuddle, hug, and play with! I've received many Christmas gifts since then but none that remained a part of my life as much as a sewing machine and the things my mom taught me about creating my own things to wear and love. I know firsthand how important a good, lasting doll can be in a child's life. I spent months before my daughter's first birthday scouring the internet for a perfect first doll for her. Everything seemed too big or too complicated. My toddler was still too young for a "big girl" doll. She just needed something cuddly to love and babble at. My older daughter suggested, "can't we make her a doll?" Together, we drew a picture of what the "perfect" doll should look like. Our doll came to fruition a few days later. I enjoyed creating it so much that I sewed dozens more, which continue to sell in stores in Charlotte, NC; Davidson, NC; Asheville, NC; and Brooklyn, NY. In 2014, I brought my endeavor to Etsy, a site I've always loved for its cornucopia of beautiful, original, and unique items. I'm proud to have a small place among these amazing and inspiring artisans. I hope you enjoy my dolls as much as I enjoy making them. I love the satisfying feeling of sewing and seeing something I've visualized take form. Dolls are a special passion. I guess a part of me still feels that old magic -- like I first did when I was 4 years old -- of discovering the wondrous world of creating. Thank you for visiting my doll shop! Do girls ever forget their first favorite doll? I know I never have. With that in mind, I sought to create a soft, sweet doll that would appeal to even the youngest child. I combined the comforting soft texture of a security blanket with a basic, easy-to-hug shape to create an irresistibly snuggly doll. Lots of infants and toddlers love dolls but aren't ready for the "girl" dolls yet. This simple baby doll is made from the same silky fur, cozy fleece, or velveteen used to make security blankets, or loveys. Snuggly Swaddle Dolls provide the security that toddlers still need, but give them something more interactive to encourage curiosity and development. There are no small parts that can come loose or buttons that can scratch. Of course, children aren’t the only ones who enjoy the dolls. Their simple shape and lovely fabrics make them perfect for display and a cheerful addition to any space. I want you to be happy with your doll! If you have received your order and have any concerns please contact me before leaving feedback so we can remedy the situation as customer satisfaction is my number one priority! Once an item has been purchased, please pay for your item with credit card or through Paypal. If payment is not received within 48 hours and other arrangements have not been made, I will relist the item. If you pay with an echeck via paypal, your item will ship when the echeck clears. For all purchases made within NC, I add NC sales tax. Shipping is via USPS first-class mail. I will ship within 1-2 business days of receiving payment. If you need to upgrade the shipping from USPS First Class Mail to USPS Express, there will be an additional fee. Please send me a conversation (convo). If you like to have the item shipped to a different address, please contact me upon purchasing the item. International Orders: In an effort to keep prices lower, packages will be shipped USPS first-class. A registered mail fee of $12.95 will be required in countries where USPS does not provide tracking. Note that you may have to pay VAT fees or other consumption tax upon receipt of your item depending on your country's requirements.